The programme at Key Stages Three and Four is aimed at providing the opportunity for students to develop their knowledge of themselves and the world in which they live. It is our hope that these tasks will lead to an empathy for and understanding of others. As a result, our students are able to lead confident, healthy and responsible lives, both as individuals and members of our modern British society. These sessions also provide an opportunity for students to spend time with their tutor and discuss topical issues which may arise during the course of the year. The tutor usually directs lessons, with occasional contributions from the Head of Year or members of the Leadership Group. The school also encourages specialist visitors and drama companies to come into school in order to cover certain topics across the Key Stages. Recent visitors include the Broxtowe Youth Homelessness Team, the National Citizenship Service and representatives from the NHS. The delivery of this information takes many forms, from workshops and individual focus to class discussion, circle time and media presentations. Students record their responses to the tasks set in their PSE book, which is regularly reviewed by their tutor. On occasions, students are encouraged to participate in charitable endeavours and visit other establishments in order to supplement the work done in the classroom. All students in Year 10 and 11 will receive their Compulsory Religious Education via a series of dedicated assemblies and lesson time within PSE, co-ordinated by the teacher in charge of Religious Education. In addition, a number of Tutor Time sessions each half term will be devoted to exploring a Thought for the Day, delivered by tutors and, occasionally, a specialist RE teacher. Students who wish to study GCSE Philosophy and Ethics of Religion will need to choose the subject as one of their options. To develop students confidence and responsibility and to make the most of their abilities. To develop a healthy, safer lifestyle. To develop good relationships and respecting differences between people. What does it mean for students in the Sixth Form at Belper School? PSE Education and Citizenship are integrated into all aspects of life at Belper School and Sixth Form; classroom teaching, tutor groups, socials times, and enrichment opportunities. The development of the whole person is central to Belper School and Sixth Formers education. The Director and Assistant Director of Sixth Form meet individually or collectively with the school Careers Advisor throughout the year to discuss the continuous development of PSE education and Citizenship within the school and to organise the programme of talks, lectures and workshops. Tutor Groups receive one period per week dedicated to the delivery of PSE for both Year 12 and Year 13. The aim of PSE education in the Tutor Group is to allow development of these and other ideas in discussion groups led by the tutor. The Tutor is not expected to be an expert in these fields but, as an informed adult, should be able to prompt lively and productive discussion. Students should start to appreciate some of the decisions that could face them now and in later life. 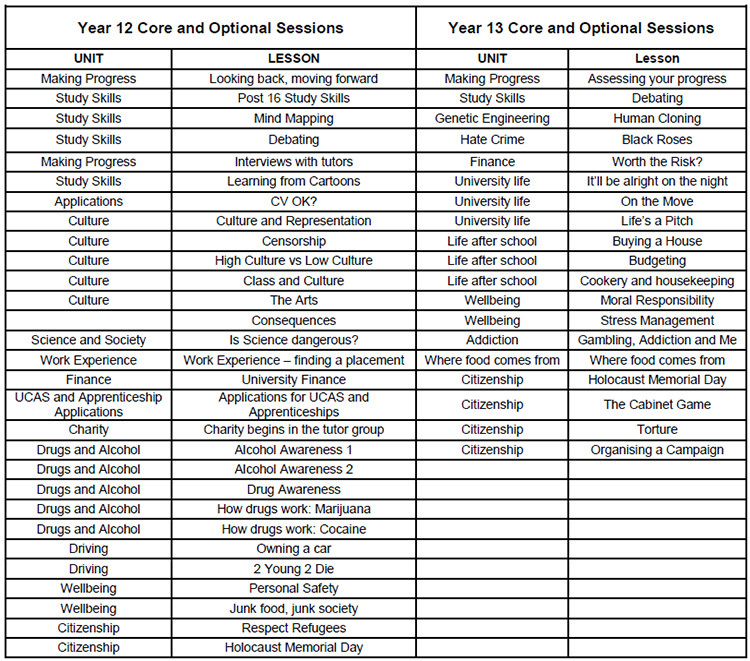 A structure of sessions is available at the start of the year as detailed below. However, the timing and delivery method of these is not fixed in order to allow flexibility with specific interests and/or the needs of groups and individuals. Assemblies are held once per fortnight and delivered by the Director of Sixth Form, a senior member of staff or an outside speaker. Throughout the year there are a number of set themes that are linked to moral, spiritual or cultural themes. As in KS4, in KS5 a number of Tutor Time sessions each half term will be devoted to exploring a Thought for the Day, delivered by tutors and, occasionally, a specialist RE teacher. The Derbyshire Sexual Health Partnership Team, The Teenage Cancer Trust, The Co-Operative Bank, Student Finance England, The Anthony Nolan Foundation, The Blood Donation Service, The Derbyshire Fire & Rescue Team, The University of Nottingham, Derby University and Oxford University, employers from local industry including Rolls Royce and Boots. In addition we also have outside theatre groups covering Road Safety Awareness and alcohol misuse. Access to specialist support. The students have access to our in house Careers Education and Guidance team that offers Information and guidance (IAG) either to tutor groups, focus groups or individuals. The focus is to cover the key aspects of Work Related Learning and advice and guidance on the appropriate routes either during their time in the Sixth Form or for plans Post Sixth Form, including employment, Higher and National Apprenticeships and Further and Higher Education. Students can access the School’s nurse once a week. Students can also receive additional guidance with regards to sexual health as part of the Derbyshire ‘C’ Card scheme. The school has a number of online resources for Post 16 students including Higher Ideas and CUDOS. In addition the school has a well established intranet that can signpost students to relevant links to outside agencies websites. For more information please contact the appropriate Head of Year.